Colour Kodachrome 35mm slide depicts an unknown man and Phyliss Snider on a beach; the man is holding a puppet and Phyliss is looking at the puppet. Colour Kodachrome 35mm slide depicts an unknown man on a beach with his back to the camera crouched down and Phyliss Snider wearing a white bathing suit looking at the camera and crouching beside him. The man is looking at something on the sand. Colour Kodachrome 35mm slide depicts an unknown man sitting in a lounge chair wearing a straw hat with an orange scarf on his head. 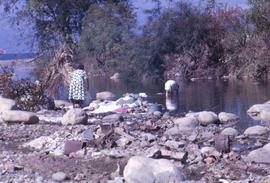 Colour Kodachrome 35mm slide depicts a woman crouching on a rock washing clothes in a river.